Since Walt Disney World first opened its gates in 1971 the majority of quick service dining establishments have been known for three things: hamburgers, chicken strips and hot dog. Well, except for the brief Handwich interlude in EPCOT Center. Over the past several months, the culinary offerings at the expected burger and hot dog joints has been shifting with the introduction of gourmet Angus hamburgers and specialty hot dogs. The most recent additions come from Casey’s Corner in the Magic Kingdom. While continuing to offer the plain hot dog, three new specialty dogs have come to Casey’s Corner: Chicago-Style, Chili Cheese and Barbeque Slaw. While in Walt Disney World last week, I had to opportunity to sample two of these hot dogs, the Chicago-Style and the Barbeque Slaw. 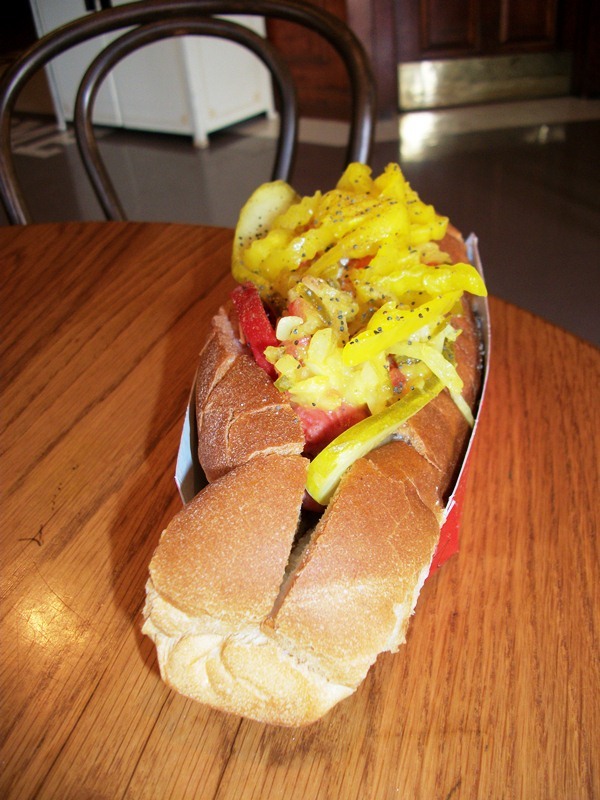 The Chicago-Style comes topped with tomato slices, dill pickle, Chicago-style relish and banana peppers. 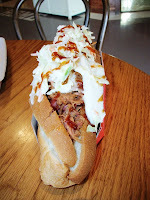 The Barbeque Slaw is paired with pulled pork, cole slaw and barbeque sauce. Coming from a place known for its barbeque and slaw, I wasn’t expecting time-tested recipes for the toppings. While they weren’t top quality, they were much better than I anticipated. As for the Chicago-Style toppings, is there really any way to screw these up? The toppings themselves are tasty and pair well with the flavors of the hot dog. There are some structural problems with the specialty dogs, however. For starters, the regular sized hot dogs are put on an oversized bun. The prevailing thought is that the extra space could be for falling or extra toppings, but on both of the hot dogs I sampled, the space ended up empty, leaving a lot of space both at the beginning and ends of the dogs. Also, like the gourmet frills added to the hot dogs at Tomorrowland’s Lunching Pad, the toppings have been piled so high on the dogs at Casey’s Corner that it is almost impossible to get both the toppings and the hot dog in a single bite. The Magic Kingdom isn’t likely to be known for worldly quick service options, such as those available in World Showcase, anytime soon, but that doesn’t mean that the restaurants can’t find new ways of serving up old classics. The specialty hot dogs of Casey’s Corner have everything you’ve come to know and love in one of Casey’s dogs, with some extra toppings you don’t have to apply yourself. There may be some issues with the fundamentals of stacking the hot dogs high and wide, they are definitely worth picking up when you’re on the go on Main Street U.S.A.